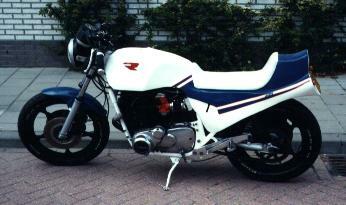 The first bike I owned was this '82 Honda XL500R. I bought it 6 months before I had my driving license, just before I turned 19. 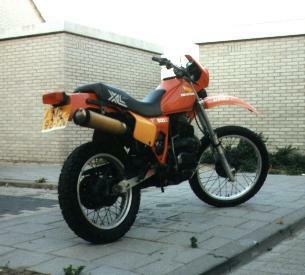 I started riding it in the middle of winter, but I didn't care then. <?B> After the Honda I got this '82 Suzuki GS550 Katana. 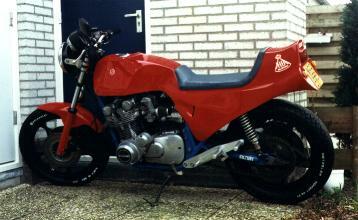 I liked the 1-cylinder Honda but the 4-cylinder Suzi was capable of higher speeds. In my opinion the bike needed some fresh paint and engine work. I took it apart, had the engine rebuild with a 610cc Wiseco kit, the frame powder coated and the rest painted. The Marzzochi shocks and Laser exhaust gave it a much better appearance. When I started working I wanted to buy a new bike. 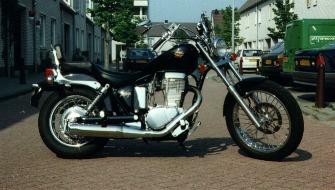 At that time I thought I wanted a chopper and didn't have much money so I bought a '92 Suzuki LS650 Savage. It was a pretty good bike but it didn't suit my driving style. 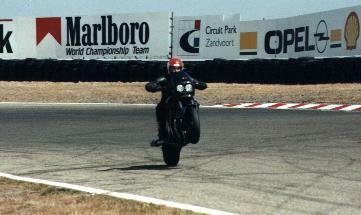 The footpegs were ground down by the flat cornering and the top speed was too low. When my mother got her bike license I sold it to her. <?B> This is the only bike I had and actually made money with. 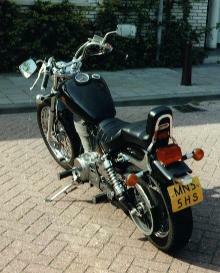 A Kawasaki Z550. I bought it together with my brother from an uncle who had it in his garden for a long time already. The battery was gone and the exhaust broken, so we repaired it and drove around with it for 7 months and sold it with profit. <?B> My brother owned this red '78 Suzuki GS750. After a while he decided it would look much cooler in the Suzuki factory colors, so he sprayed it. Later he got the brilliant idea to sort of bring it back to its original state. He then started the project, but after a while got fed up with it and sold me the bike. I continued where he stopped and added a GSX1100 swingarm and a bikini fairing. (thats what the manufacturer called it) I took the 4-cylinder apart and rebuild it and put bigger Wiseco pistons in that made it 844cc. 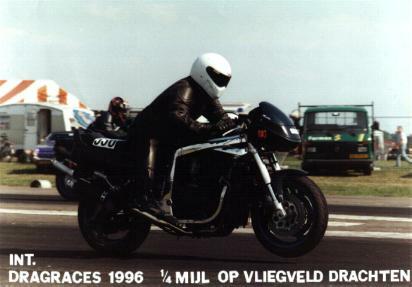 One of my friends ownes a motorcycle company and was already into dragracing. After I watched a few times I decided to start racing myself. 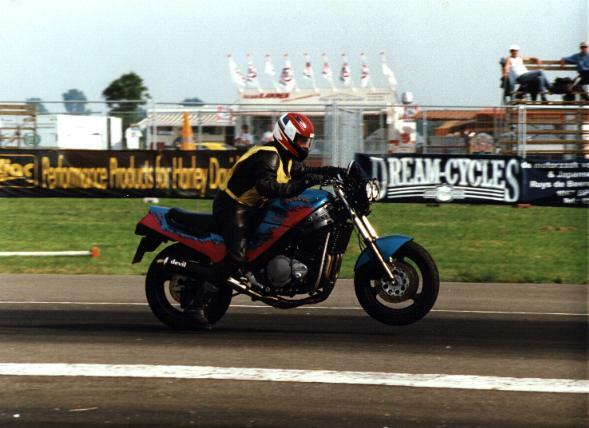 Off course the GS wasn't the fastest bike to use for dragracing, but it was what I had and I enjoyed it. <?B> This made dragracing a lot easier, brute horsepowers! 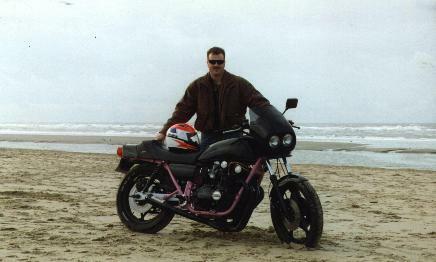 The '93 Suzuki GSX1100F started out as a touring bike. It's owner crashed with only 3000km on the clocks. I saw it and knew I could make something out of it. I took it apart and build a complete new bike. The new front end came off a GSX600F and the rear wheel and brake from a GSXR750. Now I had the 3 spoke wheels I wanted! Off course I took the clocks off a GSXR1100. I found a second hand stainless steel Devil exhaust that made great power and an even better sound. 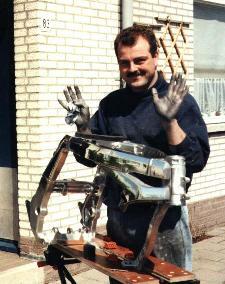 The top yoke (handmade by Willem) was made out of billet aluminium and mounted the superbike handlebar. After it was finished I took it to the Moto Mirage Dynojet and installed a Dynojet kit. It made a very healthy 135hp measured at the rear wheel. <?B> This is how I bought it, again a damaged bike with potential. It is a '93 Suzuki GSXR1100W. (yes, it's standing in the living room, I love my mum) Also this bike got the full treatment that included polishing (a lot) and paint. Trust me if I tell you that polishing is no fun, but it's the result that counts. The exhaust is a Laser 4-2-1 stainless steel with carbon style muffler. 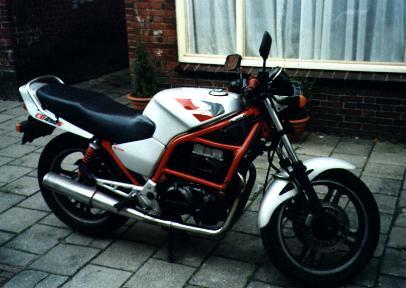 The small fairing comes off a Kawasaki KLE500 off-road bike. 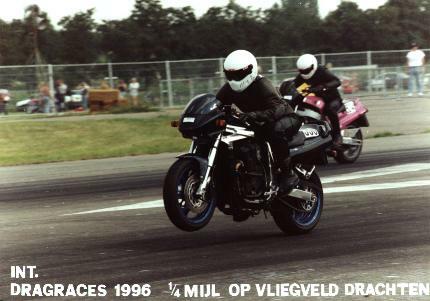 Racing at Drachten. Best results on 1/4 mile: E.T. 10.774, reaction time 0.586, 60ft 1.785, speed 211.8km/h. <?B> This is my Honda CB450S. I got it cheap and use it for transportation to and from work. Actually it is in reasonable good shape and fast enough for now.